I was quite excited when I knew that France Belleville-Van Stone was coming up with a book. I follow her blog where she posts her drawings from daily life, be it sketches from the living room, backs of her colleagues during a meeting, cars, shoes, or her cat Peaches. I like the style of her pen and ink drawings, and just her art in general. The book Sketch! is a 134-page paperback with rounded corners. The pages are designed to look like textured paper, and her encouraging text and beautiful drawings are printed on them. It's a nice presentation. This book gives us a personal account of her artistic journey and a peek into her creative process. It's one where she shares about her drawing experience, and in finding time to draw. This is more like a book on ideas rather than techniques. The inspiration comes from reading through her personal experiences. She talks about the drawing supplies that she uses, basic techniques in brief, what and where to draw when time is limited, drawing digital on the tablet (she uses iPad), and finally a list of subjects to draw listed alphabetically. If you follow her art blog, this book is like the behind-the-scenes guidebook to what she does, topics I wished were written on her blog but weren't. I find it inspiring that she can find time to draw even when she's a busy mum and French teacher — I always imagined she teaches art because of all her drawings. She gives helpful tips and suggestions on what you can draw with limited time, on handling expectations and dealing with the excuses that you might give yourself for not drawing enough. As someone who likes to draw, I could relate to many of the issues mentioned. It's a motivating and inspiring book. 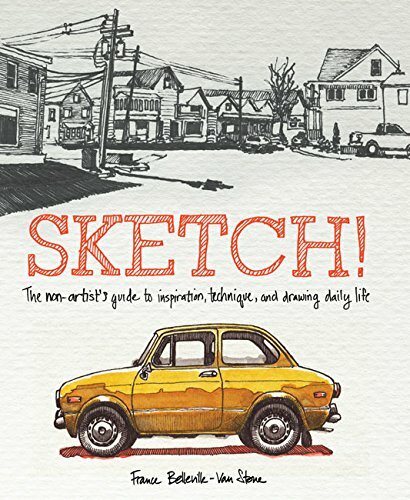 Recommended to sketchers and artists.